This set of eight experiments introduces students to various categories of waves and the language used to describe them. Each experiment focuses on practical applications of wave motion and is supplemented with lesson procedures, drawings/photos, and tips for teachers. Especially noteworthy are the lab safety guidelines written specifically for each lab experiment. Background information accompanies each activity, as well. 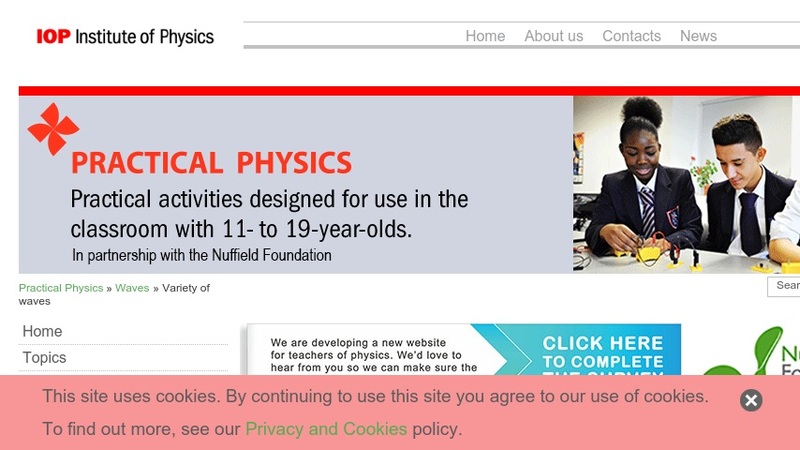 This item is part of a much larger collection of physics/astronomy experiments, sponsored by the UK's Institute of Physics and funded by the Nuffield Curriculum Centre.